At the Region is an ongoing feature that discusses the state-by-state training, certification and employment requirements of first responder departments across the nation. 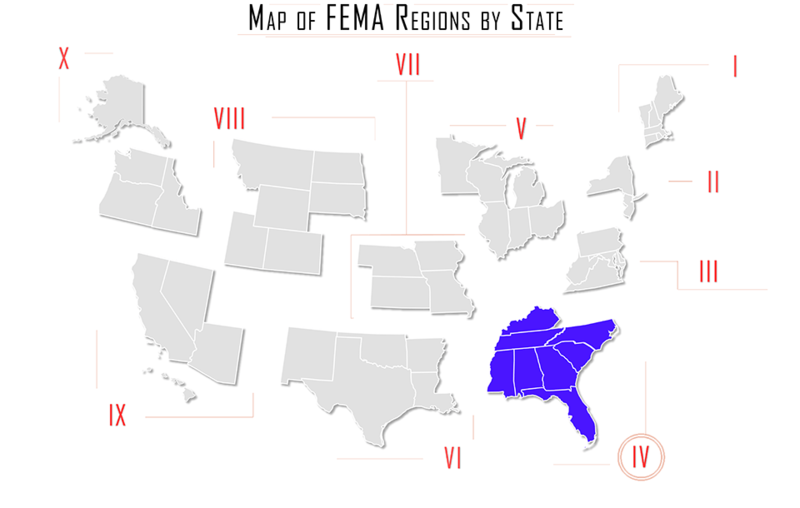 In this issue, At the Region looks at requirements in Part Two of FEMA Region IV: Mississippi, North Carolina, South Carolina, and Tennessee. A map of approved schools and their contact information is available here. Once training has been completed, applicants must register with NREMT by passing all required examinations. These exams are generally offered four times per year in state, though additional dates may be made available upon request; applicants should contact BEMS at 601-576-7380 for more information. Once registration has been completed, applicants should submit the required form, verification, fee, Jurisdictional Medical Control Agreement (demonstrating employment), and photo to the BEMS office. Mississippi offers reciprocity to EMTs who are registered with NREMT. Applicants must submit a copy of the NREMT card, along with copies of their training program curriculum and educational objectives, demonstrating that their training conformed to national standards. A Jurisdictional Medical Control Agreement is also required to demonstrate employment and the need for reciprocity. Following completion of the course, applicants must register with NREMT; this requires the completion of all examinations and pre-exam guidelines. After testing is completed, NREMT will send a copy of the results to the state office within seven to ten days; the state will then automatically issue a SC EMT certification to applicants who have passed (this may take an additional 10 days of processing). EMTs must also complete a criminal background check using the form provided here. Applicants must also submit a background check form; the check is only valid for 30 days and should be completed as a last step in the process. Appointments for fingerprinting may be made online; applicants will receive a form to print and bring to the appointment. The North Carolina Office of EMS (OEMS) under the Division of Health Service Regulation maintains the state’s EMS information site. In order to become a credentialed provider, applicants must complete a training course that conforms to NC Medical Care Commission requirements, and register with the state through the North Carolina Credentialing Information System. Courses must be at least 169 hours in length, including didactic education, skills practice, and examinations, and a course breakdown may be found here. Applicants must possess a GED/ high school diploma, or pass a test demonstrating literacy at a 10th grade level in order to be eligible for a course program. To create a profile, click the main icon to enter the Public Information Site, then click “Profile,” and “Register to Use CIS” in the sidebar menu. Once logged in, users will be able to access and complete the application. The information entered will be saved for submission for six months from the application start date. Applicants who have not been NC residents for the past five consecutive years will be required to complete a national background check; this form will be mailed as part of an information packet that applicants will receive 7 to 10 days from the date of online submission. North Carolina credentials will be issued through the date listed on the applicant’s state or National Registry card, with a maximum duration of 4 years. Application processing takes three to four weeks.